DAVID LE/Staff photo. 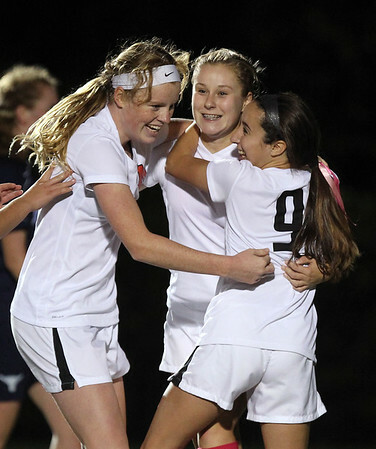 Marblehead sophomore Alexis Bostley, center, gets hugged by teammates Megan McCarthy, right, and Rory Schauder, left, after Bostley scored on a penalty kick to put the Magicians up 2-1 over Peabody with a few minutes left to play. 10/14/15.